This simple and absolutely delicious recipe was given to me by my friend Amoreena, and has been a favorite snack for the past week. It is also a great way to eat coconut oil for those who don't enjoy eating it straight. Melt the oil in a saucepan on very low heat. Pour the oil and remaining ingredients into a blender or food processor and blend until smooth. Pour this mixture into an 8 x 8 pyrex dish (or similar glass dish), and place in the freezer. 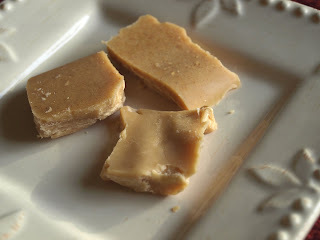 This fudge is best stored in the refrigerator or freezer. This sounds lovely! I'm looking forward to trying it! Cool, I get a place on your blog--how exciting! You guys have come up with so many great recipes, thanks for sharing them :) When does the book come out? I made this last night and what a HUGE hit!!! My 4 year old took one bite and his eyes lit up and he exclaimed, "did you put CHOCOLATE in this?!?" (He's a huge chocolate fan, so that's a big compliment to this fudge. :) I was wondering what brand of peanut butter you use - is it OK if it's made with roasted peanuts? This sounds just amazing and I must try it asap!! I was trying to find a way to get more coconut oil into my kiddos and this may be it! We have an anaphalactic peanut allergy so perhaps I'll make some almond butter to use instead? My kids loved this so did my husband, but beware the coconut oil will cause die-off. Not that this is a bad thing, but the coconut oil has antifungle properties and we had a couple die off episodes! Other than that it was fabulous! I like making it with Maranatha Crunchy peanut butter, but we're currently not eating peanuts and I've enjoyed it with almond butter and sunflower seed butter as well. I have made something like this a few times, great minds thinks a like, eh? :) I usually add cinnamon though and recently found cocoa butter so I add that too. It does set the melt point lower though, so you have to be careful about that. And we have always used almond butter since we haven't had peanuts yet. This is too delicious! I had a bad experience with coconut oil a few months ago, and we're still not getting along very well. With that in mind, I decided to double the peanut butter in the recipe. I used 1/3 cup honey (a tiny bit too sweet for me, but excellent for the general public), and 1 Tbs. vanilla. I left out the salt, because I used salted peanut butter. I also did not use a food processor (it was in the dishwasher). I just threw everything into my pan and used a whisk to combine. Everyone in this house loved the result. It took about an hour for it to set up in my freezer. I made these with coconut oil, because still sensitive to even ghee. My kids!...and I loved them still. Thank you for these great recipes! You have helped me to see that recipes aren't that difficult, and with a little trial and error you can make it work. And taste great too! My 5-yr-old said it was chocolate too! Everyone raved about it and I had to beat them off before they ate the whole pan. Let me just say, it tastes better with almond butter. Like sweet, vanilla goodness. The peanut butter doesn't complement the vanilla as well. I also like some of the comments too. It was rather interesting for me to read that blog. Great read thanks for the awesome blog! Alright, this has little to do with the recipe, I admit, but I'm just so stunned that your friend's name is Amoreena. Mine is Amorena, the same, just with one less 'e'. I was named after someone named "Amorina", and other than that I've never heard of anyone else with any variation of the name. What a wonderful thing to come across while searching for recipes. I can`t eat nuts,would wow butter work in this recipe?